There’s something magical about hearing the pitter-patter of rain on your tent as you sleep, surrounded by forest of Douglas fir, cedar and alder trees. How about waking up to a ready-made breakfast and taking a long walk in the crisp air along one of the region’s most popular trails? Then riding a comfort cruiser six miles into town for lunch, and capping your day kicking back at the pond near the lodge? 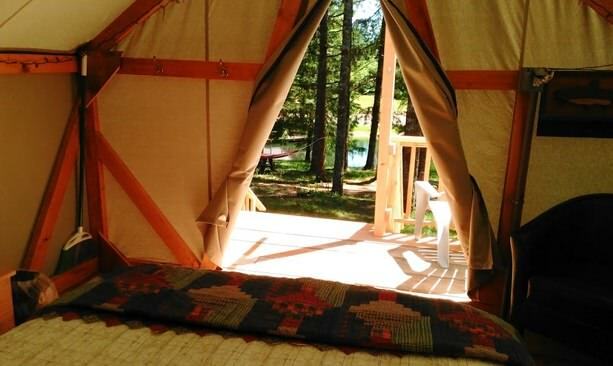 It’s all part of the glamping experience at Vernonia Springs — a private 28-acre property an hour west of Portland — a quick and easy getaway. 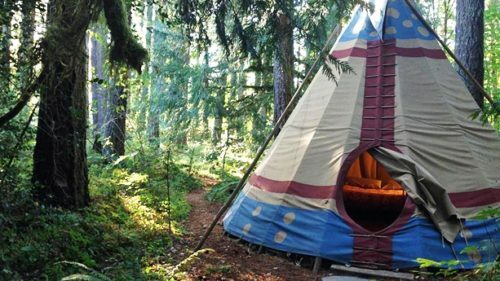 Jeff Walton, a former restaurant owner in Portland, bought the property in 2013 and opened it for group camping, yurts and wall tent rentals in May 2017. “Other than clothes, we provide pretty much everything you need, including a really good breakfast in the morning,” says Walton, who offers a hearty, locally sourced $10 scrambled egg breakfast to guests, prepared at his licensed food cart on site. He plans to offer a lunch and dinner menu in 2018. Convenience factor aside, the primary draw to glamping is the feeling of peace and comfort in nature — especially in fall, when you can still camp but be blissfully warm and dry. 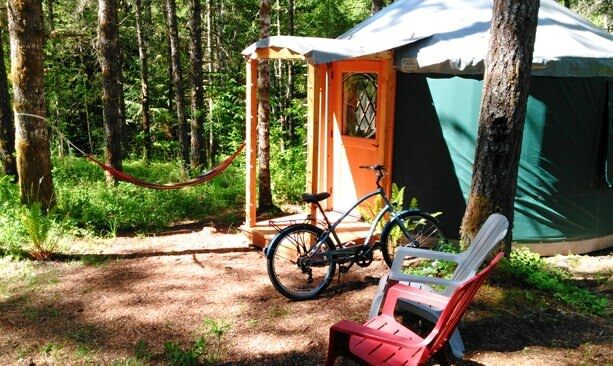 Built by Cottage Grove-based Pacific Yurts, all three of the yurts and the wall tent are fully furnished, with luxury queen-sized beds, linens, electricity and wi-fi, as well as access to bathrooms, showers and cooking facilities on site for your own cook-out. One of the yurts is dog-friendly. Each sleeps up to four people, with a daybed provided for an extra $10 per person (or bring a sleeping bag for the floor). 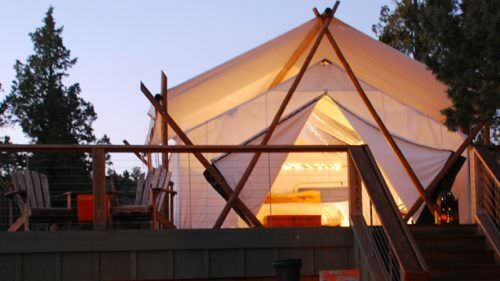 The round, wood-framed yurts are 200 square feet, fully enclosed, with a skylight and heat. The 144-square-foot wall tent has no heat, and closes for the season on Nov. 1. The yurts will stay open through late November or perhaps later in the winter, to meet demand, Walton says. This being his first season, he recommends checking the website for details. The centerpiece of the property, meanwhile, is the pond — which stays cold and clear all year long because of the springs that feed into it. 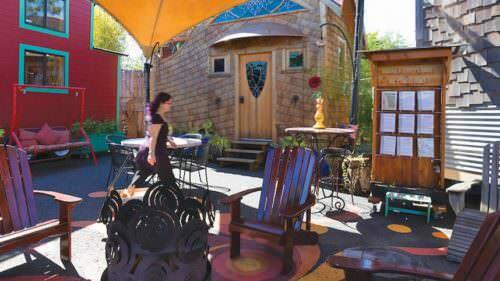 Facing the pond, guests can enjoy the straw bale lodge, built by an Ashland company, that makes for a cozy spot to enjoy breakfast, play games, rent Trek bikes and gather around the wood-burning fireplace. In April 2018, Walton plans to launch the property’s second season with two more yurts and several more wall tents. He also plans to start an organic garden to support the food cart. Yurts as well as cabins are are hot commodities at various Oregon State Parks, often requiring reservations a year in advance for summer weekends and holidays. 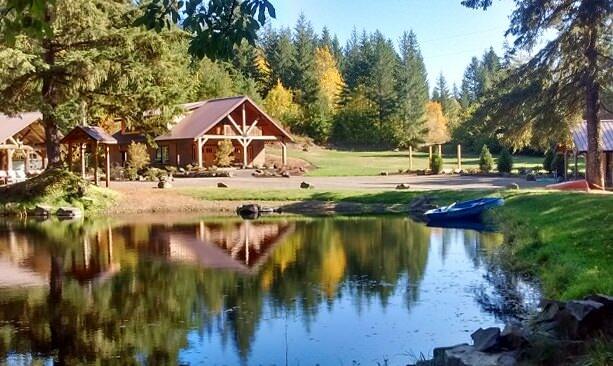 Even if you don’t stay at Vernonia Springs, it’s a perfect weekend getaway spot. Bike or walk along the 21-mile Banks-Vernonia State Trail, a tree-lined, paved trail that runs through the middle of the Vernonia Springs property. See the century-old railroad trestles, remnants of the lumber industry that carved this path through the wilderness — hence its status as Oregon’s first rail-to-trail. Extend your ride on the Tualatin Valley Scenic Bikeway, a 50-mile route that includes the Banks-Vernonia State Trail, rolling by farms, vineyards and incredible views of the Oregon Coast Range, with plenty of tasty detours along the way. Visit Stub Stewart State Park, with 25 miles of killer mountain biking and hiking trails open for exploring year-round. Visit the old timber town of Vernonia and stop in for coffee, a beer or a meal along their main street. 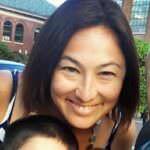 Try Blue House Cafe, La Cabana Restaurant, Black Iron Grill (which also runs Black Bear Coffee and Bear Creek Pub), and Mariolino’s. Enjoy the lakes, creeks and parks. There are eight parks in town; Vernonia Lake City Park is lovely for picnics and fishing in the spring, when it’s stocked with rainbow trout.